Whether given to others or placed in a sacred location, Hawaiian lei symbolize the Islands’ culture of love and friendship. Take part in local history with lei-making classes across Hawaii. In late March, sitting at a table with another family in Hawaii, I meticulously threaded pretty purple flowers into a lei I could wear for the next few days of my trip. Ubiquitous in the islands, the floral necklaces are handed out for happy and sad occasions, milestones, achievements, birthdays and even deaths. As I discovered, the lei is as old as the Hawaiian Islands themselves, having been brought over with ancient Polynesians arriving from Tahiti. In fact, its entire story is truly fascinating and sheds light on the warm, welcoming culture of Hawaii. Traditionally, the lei itself is made from found items in nature — such as bones, shells, feathers, seeds, nuts, fresh flowers and other foliage. 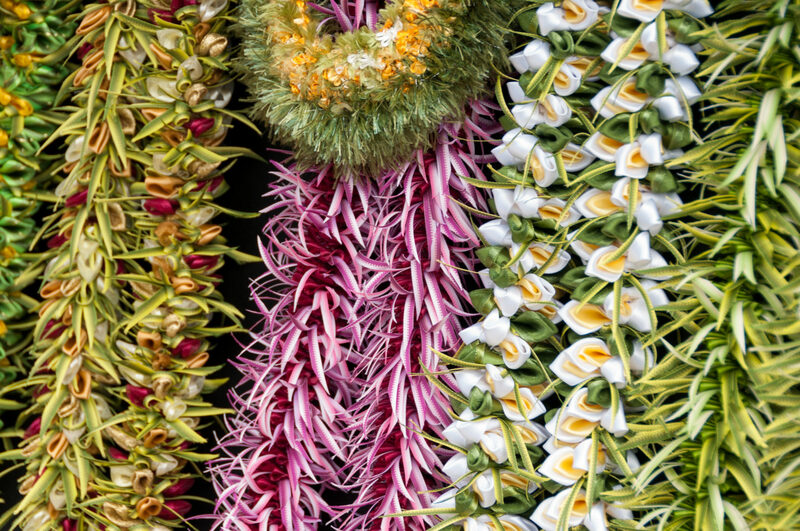 Each piece used to make the lei reflected some aspect of Hawaiian culture or life. In ancient times, specific plants represented certain deities, allowing the lei themselves to be symbols of spirituality. They were commonly placed in or near holy areas to show reverence and respect. Early Hawaiians wore lei to beautify themselves and show appreciation for the world around them. They were also used to show rank or status among the community, and they signified a peace agreement between chiefs. When exchanged between two people, lei were presented in pū‘olo, a bundle or package made from lau kī or ti-leaf plants. 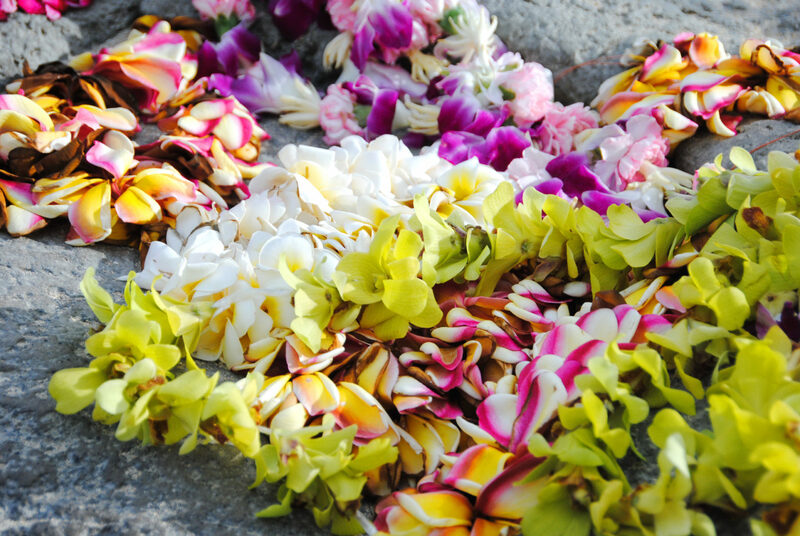 The lei of today is similar to those of the past; each major island has its own representative color and flower, and they’re still often made from found materials. During my class, I created a lei from nasturtiums, a pretty and edible flower. The class leader joked that we could just eat our lei when they started to wilt — that way, the lei can infuse their mana into us! It’s disrespectful to throw a lei away when it’s wilted and no longer wearable. 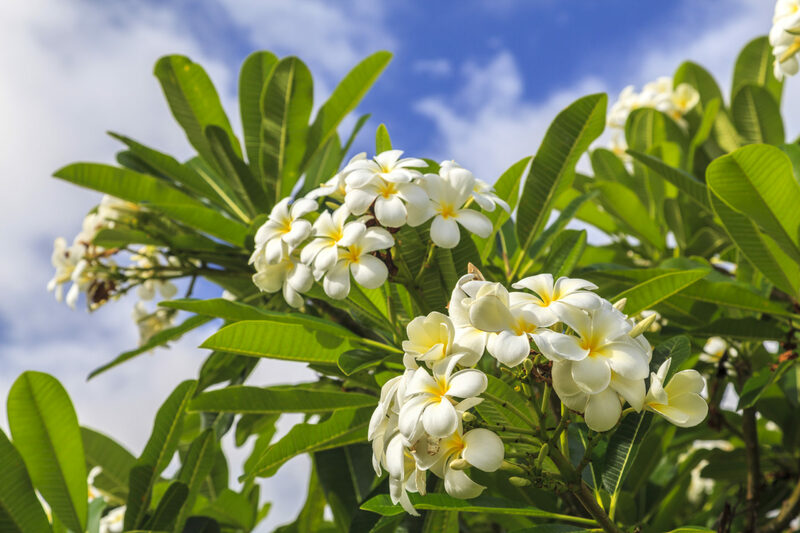 Instead of pitching it, dry the flowers out and keep them, scatter the semi-fresh ones outside or in the ocean, or hang it on a tree so a passerby can appreciate the remaining beauty. Today, a lei is presented by raising your arms and placing the lei around the recipient’s shoulders — followed by a kiss on the cheek. This differs from older times, when it was unacceptable to raise your hands or arms above someone else’s head. This ancient method of lei giving is still in use and accepted today, especially when giving a lei to a pregnant woman. Kauahi notes this is due to symbolism — a closed lei around the neck represents the umbilical cord wrapping around the baby’s neck. So, pregnant women untie the lei and wear it open after it is given. Many resorts and hotels on the islands offer lei-making classes for tourists hoping to try their hand at the practice, and the Royal Hawaiian Center has complimentary classes several times a week. For those traveling in the spring, the city of Honolulu hosts an annual Lei Day on May 1 — a 90-year tradition that includes free lei-making classes during the days building up to the event. After your lei is complete, maintain its freshness by keeping it in the fridge when you aren’t wearing it. If that isn’t possible, keep it wrapped in a moist paper towel inside a sealed plastic bag. Your lei should last up to three days. 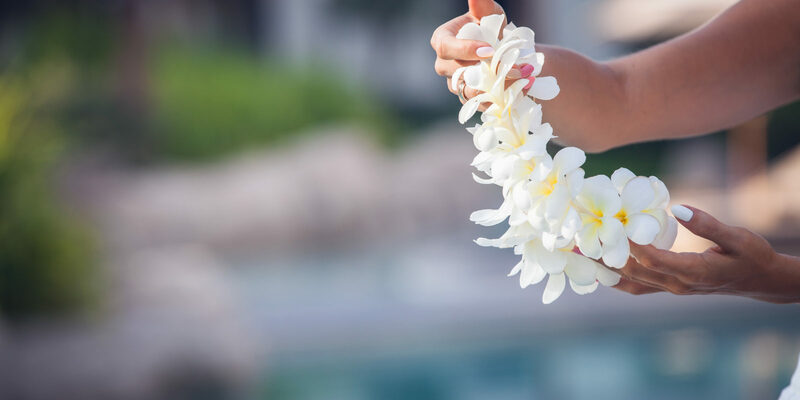 Learn to make an authentic Hawaiian lei at Marriott’s Waikoloa Ocean Club. Jennifer B. is an author, freelance writer and editor living in Wisconsin.